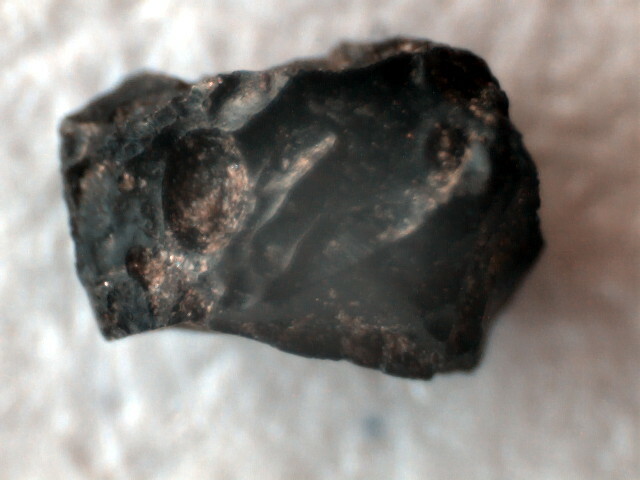 Searching for micrometeorites at home. Has anyone here done this sort of thing? How strong of a magnet is needed? Mark beat me to it, I was gonna post that same link. If you live near any industrial sites, you will find a ton of terrestrial particulates. They can carry for miles. There are likely some micrometeorites in the mix, but separating them out is tedious. To introduce myself, I'm Joe, and new to Cloudy Nights, but not new to our hobby. This is my first post. I've been an observer, ATM, and photographer since the early 1960's (or before, really). 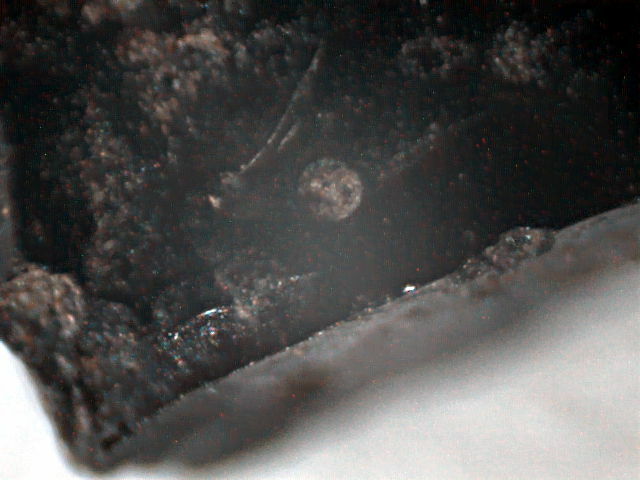 Additionally, I've had an interest in micrometeorites since about 1967. I collect them from rainwater. Simply put, I gather about a gallon of rainwater as it falls from the sky in a wide, clean vessel held well above the ground (to avoid soil splattering in), say, on a picnic table. Then, with the water gathered, it's time to evaporate all of the water (but for about 1/4 ounce). One can evaporate the water passively, but that's slow. Lately I have done it in a large clean stainless steel uncovered cook-pot on a low flame on the stove. It takes a few hours. You only have to pay attention when there's just a little water remaining. When most of the water is evaporated (or all of it, if you ignored the process, and it burnt up the organic matter ("dust"; pollen; plant-parts; etc.) in the rainwater), remove the pot from the heat, and let it cool completely. Then, slosh in about an ounce of rubbing alcohol (70 percent; or, 91 percent), and scour the pot well with a perfectly clean object of some kind (a gloved finger, say), and get all the solid residue wet with the alcohol, and suspended in the alcohol. You don't have to be completely thorough. Then, pour the ("dirty") liquid into a small clear vial, and cap it with a non-porous cap (cork is prob. not the best). Anytime you like, SHAKE the vial to suspend the contained particles in the light liquid. The tiny particles will settle pretty fast in the thin, low-viscosity, mostly-alcohol vehicle. Then, stand the vial upright somehow, and place a MAGNET somewhere touching the vial, say, half-way up its height. Go do something else for half-an-hour. When you come back, you'll see that the liquid has gone nicely CLEAR, and that the bottom of the vial is coated with dark brown "dirt", while the inside of the vial near the magnet is ALSO coated with "dirt". 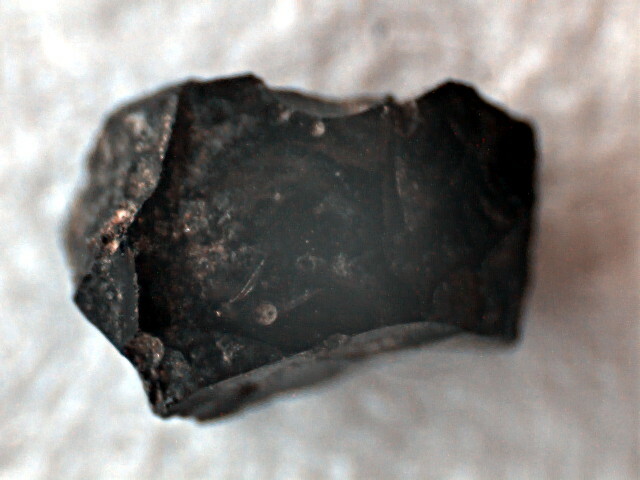 I contend that the magnetic stuff is MOSTLY of extraterrestrial origin (micrometeorites). To prove that the magnetic stuff is micrometeorites, keep the magnet near the tube, and remove a sample of the magnetic stuff, and place it on a microscope slide, under a decent microscope. Using a couple hundred power or more, look at the particles. Many -- or MOST -- are extremely small, JAGGED, and very sharp. They are not rounded, not fused. 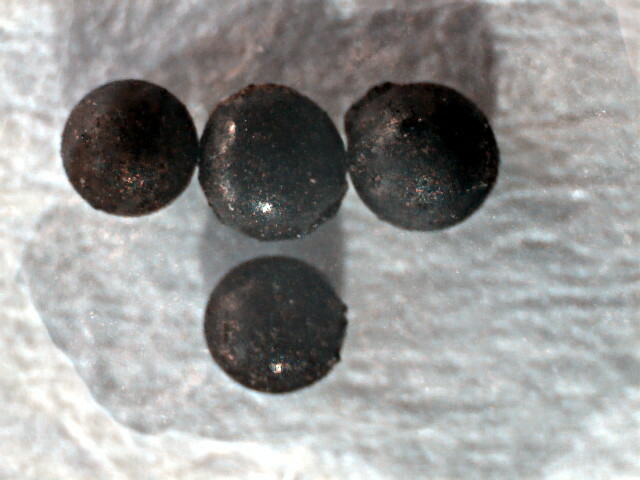 IF these are indeed micrometeorites, they are tiny enough to cool themselves as they enter the Earth's atmosphere. Their ratio of surface-area to volume is HUGE. Hence, THEY DO NOT MELT by friction on entry, nor are their sharp edges even blunted. They "land" intact. There may be lots of stony-meteorite dust, too, but if it is not even slightly magnetic, well, it will not stick to the side of the vial near the magnet in contact with the vial after shaking. Now, I have not carried out further tests of this material besides magnetic and microscopic tests. I've considered spectroscopy of vaporized samples, and x-ray fluorescence spectroscopy of the solid samples, but have not gotten around to these tests. I'll be vastly dismayed if someone proves to me that the magnetic material collected in this way is NOT really micrometeorite material. But if someone has that verdict authoritatively, I will of course be happy to learn its origin ...after all these years, if not extraterrestrial. Good luck to everyone who carries out the above simple procedure! > Has anyone here done this sort of thing? Edited by desert_woodworker, 30 April 2016 - 09:02 PM. Your collection and processing procedures are nicely thought out and described. I would reference the Facebook page mentioned above by Michael and Mark as well. The problem I see here is assuming that the material collected by magnetic separation is necessarily meteoritic in origin. No doubt some of it is. But, there is also likely to be a component due to industrial pollution, specifically fine particulates composed of molecular iron, or ferrous compounds. How much, if any, would be dependent on weather patterns and your proximity to smelting facilities. Don't get me wrong, I applaud your efforts and findings, I'm just pointing out a possibly significant source of error. The author of the Facebook site has done pretty extensive research, you may benefit from contacting him. Hi, nice post! Interesting stuff. I'd only add that... well, no offense to this fine forum, but I think very few people are reading it in comparison to some other sites - a small fraction in fact. If you'd like more extensive feedback to your post I think you'd be better off posting it here. Thanks, Lee. It's good to be here at this board to have some feedback and discussion. I appreciate your reply. Well, I won't be using Facebook because I am not a member, and do not wish to join (a decision made years ago). But it's a nice collection of rather macro-sized meteorites that the fellow has put up there, as far as I've read. Very attractive and nicely displayed. 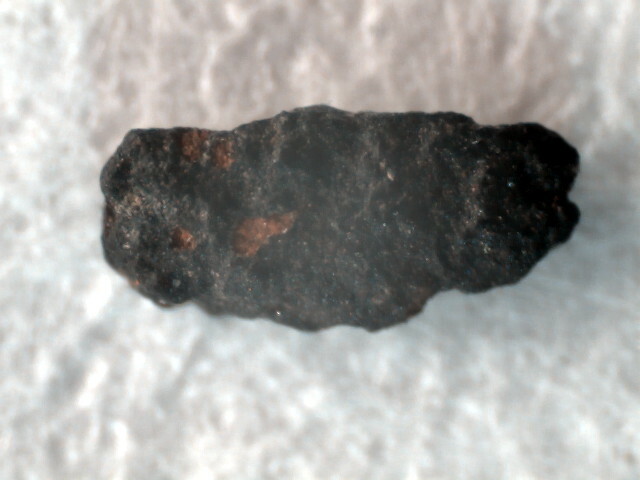 I might as well go ahead and collect some of this type of fused or melted meteorites, too, such as is shown there. The objects that I so easily extract from rainwater are the true micro-sized particles (if indeed they are micrometeorites; that is, of extraterrestrial origin). As I write in my first post, there is as yet no certainty that they are meteoritic dust. But I think the likelihood is good that the sharp, un-dulled particles that I collect and observe by the tens of thousands are meteoritic. Again, no certainty of this until someone does a chemical test for iron-meteorite (or etc.) composition. I invite and encourage all interested parties here to carry out the simple procedure themselves, and study the magnetically-separated component under a decent microscope. Note that, in the Solar System, the number of particles goes UP as the size goes down. Thus, we would expect many (hundreds... ) more times the number of (micron-sized) micrometeorite particles such as the ones I collect to be present on Earth, than the macro-sized ( ~ millimeter) fused objects collected in rain-gutters and rooftops. The dust I collect serves as nucleation-centers for raindrops. I have wondered for a long time how many raindrops -- what fraction, I mean -- formed, due to a flake of extraterrestrial material... .
p.s. These particles are probably a large component of the dust that is responsible for the light-scattering in what we call "The Zodiacal Light" (and the"Gegenschein", opposite the Sun), as seen from good sites, and its extension, "The Zodiacal Band", stretching completely around the Ecliptic, as seen from the best sites. -J.
Edited by desert_woodworker, 30 April 2016 - 09:38 PM. Thanks for reading, and thanks for your suggestion! For now, I'm only keen to contribute to the Cloudy Nights site. Edited by desert_woodworker, 30 April 2016 - 09:33 PM. I understand the reluctance about Facebook, but there are people and content there simply not to be found elsewhere. If you keep your privacy settings high, most annoying issues can be avoided. There are good discussions on this forum from time to time, but they are becoming more infrequent. At least several of the people are involved in the site Mark referenced above. A collection of material downwind of a known metal processing facility might be interesting. If you know the heights pollutants are reaching in the atmosphere, you might be able to estimate where they're coming down by taking into account the weather and jet stream patterns. Actually, in this country pollutants might be relatively low when compared with less regulated locations. I've seen estimates of the total amount of meteoritic dust deposited on the planet every year. Some calculations ought to give a fair estimate of what might be deposited on a small collection area. A comparison to how much you are collecting might be informative. Thanks, Lee! Good thoughts all, you offer there. I've collected rainwater and magnetically separated the particle component in three different States where I've resided -- New Jersey, New York, and Arizona. The sharp and spiky microscopic magnetic dust looks the same in all these places. This is another reason why I have some confidence that it is extraterrestrial and not a technological pollutant. (Facebook does not interest me, to join. If I can read a thing or two there as a non-member there, though, that's fine). Lee, are you interested in doing an experiment?, and do you have a decent microscope? If "Yes", I suggest (and encourage) you to collect very clean rainwater, evaporate it, suspend the remaining solids in alcohol, put it in a vial, shake it up, and place a magnet at the side while the mixture settles. Then just look at some of the magnetic component on the microscope stage. And if you have ways of testing the sharp and spiky magnetic dust chemically for its composition, great! In the past, I thought about collecting rainwater at different times of year to see if there is a correlation with meteor-shower maxima, in terms of "weight-of-the-magnetic-component-per gallon-of-rainwater". But I did not have access to a good analytical-balance in those days. But now I own a fine low-capacity digital weighing-scale which is very highly sensitive. However, I cannot do this experiment of trying to correlate the amount of magnetic dust with the meteor-maxima calendar where I currently live: it rains so SELDOM in the desert! I cut and etch meteorites, and the process requires distilled water. At least water without any trace of chlorides, So, in the winter I melt snow, and the other half of the year (central NY, you know) capture rainwater. Clean catch filtered rainwater (not off of the roof) shows nothing at the macroscopic level. Melted snow shows a very fine black residue, much of which can pass the filter paper. Lacking a microscope, I've never examined it. I suspect it originates in the midwest coal fired generating plants, but that's just a guess. Rain forms relatively low in the atmosphere, so any non-terrestrial particles must be falling at least to cloud level. It stands to reason that the same material is making it to the ground with or without the rain. Rain collected matter will certainly give you a cleaner sample since it would suppress dust and contaminants, but there must be some percentage of meteoritic material present in a dust sample collected from a clean surface at ground level. Have you thought about examining something like that? I don't know about a correlation between meteor shower activity and the amount of non-terrestrial material. I suspect there would be quite a lag in deposition time since the material is so light, it could easily be suspended in the atmosphere for months. But you're right, it does stand to reason that more would fall during a shower. This calls for a long term study, that would make any lag time irrelevant. Estimates of amounts of meteoritic dust falling every day vary widely, 100 tons per day is a mid-level value. A rough 'back of the envelope' calculation shows 2 x 10^-7 grams per square meter per day. So, more than a microgram per week. Not an insignificant amount! 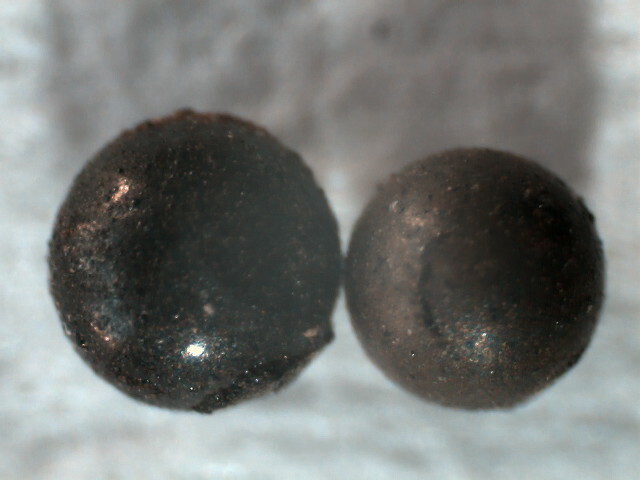 a few photos showing how to distinguish micrometeorites from other particles. 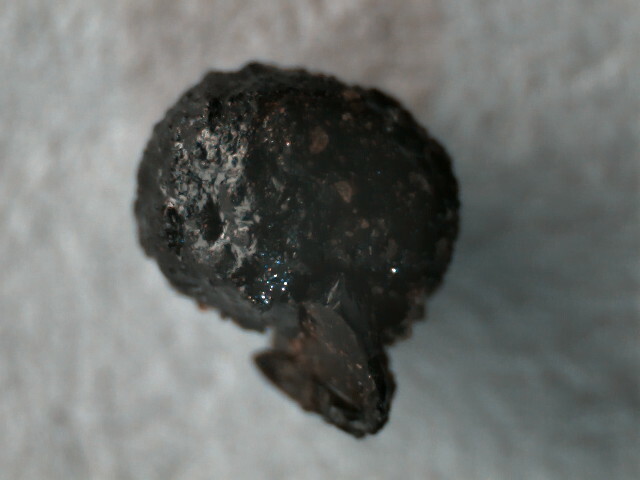 I attach a photo of an Isopropanol-filled vial containing true micrometeorites (if they really are that). 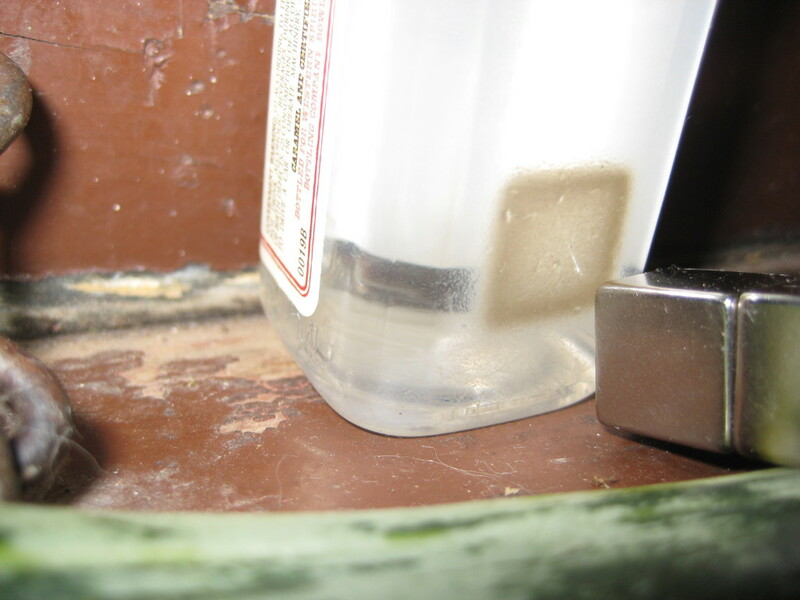 For the photo, I removed the 1/2-inch cube Samarium-Cobalt magnet stack from the side of the vial, to show the pattern of attracted magnetic particles on the inside of the vial on its vertical wall. these are the particles which I describe above as very sharp, jagged, un-melted because so tiny and able to cool themselves by radiation as they enter the atmosphere, and, well, magnetic. Anybody can do this at home, after the next good rain. This sample was derived from one gallon of rain in July, 2014 in Tucson, AZ. Edited by desert_woodworker, 02 May 2016 - 06:16 PM. Edited by EricTheCat, 08 February 2017 - 08:35 PM. I doubt the spherules are ET in origin, but I'm no expert. That number 3 pic sure has some meteoric features, however. Too cool. Here is the other side of that one. Edited to add, I just dug these out to make sure I still had them and this one is actually just over 1mm. Edited by EricTheCat, 11 February 2017 - 10:36 PM. So I was over at Adafruit's blog and it looks like a musician Jon Larson has a book coming out about MicroMeteorites. I'm about to read the article now. Looks like he gets into how to tell which are real and which are terrestrial. Ok Is it safe to assume that this FB page is the same guy as the author of the book I just posted? I'm going to go with Yes. There is a really good new video on youtube about searching for micrometeorites. I thought some here might like to see. Fascinating. And an excellent, resourceful contribution. I may try that some rainy summer's day. Likely a good way to capture particulate matter that is not of meteoric origin, as well. I possess a small microscope, which may come in handy.